Everything you wish for your coming soon page is now possible with Everest Coming Soon – an ultimate WordPress coming soon plugin Lite. Whenever your site is in maintenance mode or under construction, make it smooth and pleasing to your visitors. The plugin is packaged with 2 beautifully pre-designed coming soon page templates, choose any and create the most appealing maintenance pages faster than ever. It is a highly flexible plugin which authorizes you full control to configure most of its components as per your preference. Everest Coming Soon has included the entire possibilities, that you could have thought of. It allows you to embed countdown timer, contact form, subscription form, Google map, site completion percentage loader and much more. Besides, you can personalize your coming soon page with custom logo, custom background, social links, quick infos, enable/disable maintenance mode as per user role and so on. Do your work in private and make it pleasing and professional-looking to others. 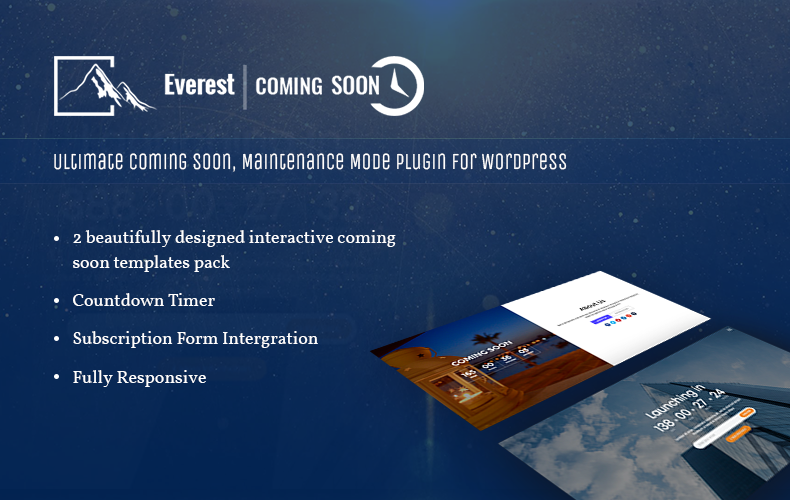 Hey Buddy!, I found this information for you: "Ultimate Coming Soon, Maintenance Mode Plugin for WordPress – Everest Coming Soon Lite". Here is the website link: https://access-keys.com/wordpress-plugins/ultimate-coming-soon-maintenance-mode-plugin-wordpress-everest-coming-soon-lite/. Thank you.